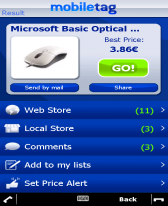 PocketShopping v2.00 freeware for Windows Mobile Phone. 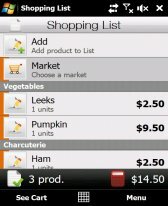 Summary: PocketShopping is a finger-friendly shopping list software which allows you to maintain a master list of products you buy on a regular basis. - One master items list shared across all shops with the ability to add or remove items from each shop. - Fixed: sometimes an exception was launched when displaying the keyboard. - Fixed: landscape mode was not supported correctly. - New option which allows to keep the scrollbar always visible. - When a shopping is finalished, all the bought products are unchecked automatically as products to buy. 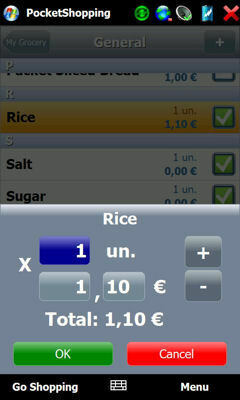 - A numerical keyboard can be used to set both the quantity and the price of the products. - Now it is possible to set decimals when setting the quantity (for example to set the weight). - The products can be checked by using the OK/ENTER key on the device. - Fixed: sometimes the checked products were not saved. - Improved the look&feel; of the dialogs (settings and element properties). 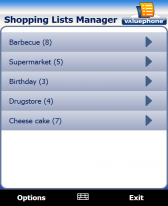 - Now it is possible to reset the shopping list for only the current shop. 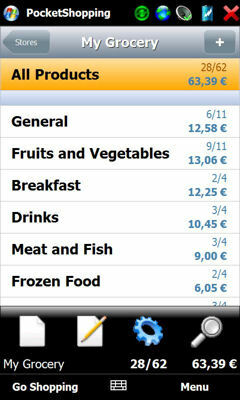 - Fixed bug that the shops could not be deleted from the shopping list. - Fixed bug when changing the data folder. 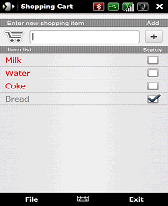 - The shopping list is saved automatically when the application goes to background. - On edit mode now it is possible to copy and move both categories and products. On the toolbar four new buttons are displayed (copy, cut, paste and delete) and the same actions are accessible from the new "Edit" menu. - Added option which allows to hide the bought products. - Language is configurable from the settings dialog. Now each language is loaded from an .ini file, and therefore it is easy to translate the application to another languages. - Added possibility to set the price for each product. By clicking on a product, a panel is displayed which lets you to set both the quantity and the price of the product. 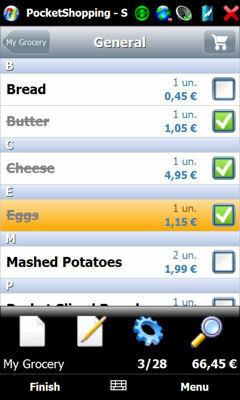 A new status bar is displayed which shows the total price of the shopping list. - Added configuration options to show the product description, the category description and the shop description. Fonctionne sur HD2 et en français de surcroît! Great app! could you please make it possible to send the shopping list to another person with the same applet. Within a family this would be very usefull. I love it. 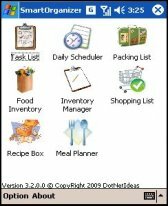 I can make a list of all the stuff that I need, and for each item I can indicate what stores it is available at. Then when I am at the store, it shows me a list of the items available at that store. Much easier than sorting through a list that contains all sorts of items from hardware to groceries. It would be nice to have some instructions, but I figured it out for the most part. The only drawback is that everytime I add a new item it automatically is available at all stores. I wish the stores were limited by categories. i.e. if I am adding an item to the frozen food category, then Home Depot should not even be one of the available stores because it doesn't have a frozen food department. Also the scrolling is very awkward, and I often scroll too far or not far enough and have difficulting getting to where I want to be. Kinda arkward to use as it takes so many navigations to do stuff. And it's kinda buggy. For example, it "sometimes" tells you to not use duplicate names but it allows you anyway. And when you do it, it starts confusing where items should go and some just disappear completely. could not get it to work, hd2. Very nice. Works great om HD2. Super pratique et trés ergonomique. le meilleur gestionnaire de liste de course que je connais. no pb sur HD2. Works great on HTC Pure. Took awhile to figure out exactly how to use the app, but once you get it it's awesome. Totally customizable, can add any products, stores, or categories you want. Only drawback is units are metric, not U.S. imperial. it's really looking great. but what a pity it doesn't work on my Touchpro2! It doesn't show anything I type...??? please look into it. Seems to be the best shopping app (tryed a lot!) and I would gladly pay for it!